Jay Leeuwenburg is an imposing, 6-foot, three-inch, 295-pound physical specimen which goes a long way in his field of work as an offensive lineman in the National Football League (NFL). Even before Leeuwenburg was a teenager, he weighed as much as 170 pounds. At the age of 12, however, he began losing weight at a rapid pace, and eventually whittled away to 130 pounds. Upon seeing a doctor, Leeuwenburg discovered he had type 1 diabetes. Leeuwenburg immediately learned all he could about type 1 diabetes and how to manage it. One of the things that he learned was that exercise was a helpful way to control the condition. In high school, Leeuwenburg made it a priority to be physically active throughout the year. He accomplished this by playing football and basketball, as well as being a member of the wrestling team. “From the onset of my diagnosis, I made exercise a part of my diabetes regimen,” says Leeuwenburg, who adds that he never had any doubts that diabetes would hinder him in any way. Leeuwenburg was a good enough offensive lineman to earn a scholarship to the University of Colorado. It wasn’t until his senior season at Colorado that he realized he was capable of fulfilling his dream to play in the NFL. In 1992, Leeuwenburg was drafted by the Chicago Bears and became an all-pro offensive lineman. 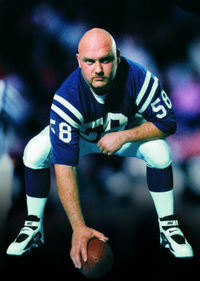 Leeuwenburg started every game from 1993 and 1995 before joining the Indianapolis Colts, where he appeared in another 37 consecutive games. Today, he plays for the Cincinnati Bengals and credits his impressive track record to hard work, lots of sugar and preparation. Leeuwenburg says that he manages his type 1 diabetes while maintaining the rigorous exercise schedule of a professional athlete by following a high-calorie diet. On game days, Leeuwenburg eats at breakfast consisting of 6 eggs and 4 pancakes, 3 to 4 pieces of fruit and 2 chicken breasts. He then takes 18 units of Humalog and 8 units of Humalin N on a sliding scale. When Leeuwenburg is not training, he says that he cuts his caloric intake by 30 percent. On normal days, Leeuwenburg tests 8 to 10 times. On games days, however, he tests as much as 40 times, including every half hour leading up to game time. He once had a hypo during a game in high school and drank a six-pack of Coke to correct it. In college, he switched to glucose tablets. Today, the Bengal’s trainer keeps Gatorade by the bench in the event that Leeuwenburg goes low. Leeuwenburg usually keeps his blood sugars around 120 mg/dl and his HbA1cs between 4.9 and 5.8%. When asked if he lets his blood sugars get high before a game, Leeuwenburg replies that each person with diabetes is different. Leeuwenburg says that he will only take insulin during a game if his blood sugars are high at halftime. Jay Leeuwenburg is on the board of the Juvenile Diabetes Foundation (JDF). In October 1999, he testified before Congress for more research money for diabetes. He also works closely with JDF, Roche Diagnostics and Eli Lilly to develop programs that help educate and motivate other people with diabetes. Leeuwenburg was instrumental in helping start the “Bag of Hope” program in which bags were distributed to children recently diagnosed with diabetes. The “Bag of Hope” contains a workbook that explains diabetes in simple terms, a video where Leeuwenburg shares his experiences and gives tips on living with diabetes, a life-size growth chart of Leeuwenburg that reads “Yes, I Can! Yes, I Can!” and a workbook for parents of children with diabetes. As Leeuwenburg prepares for the bumps and bruises that will come with being an offensive lineman in the trenches, he sticks by his motto that has made him successful in controlling diabetes and the NFL.